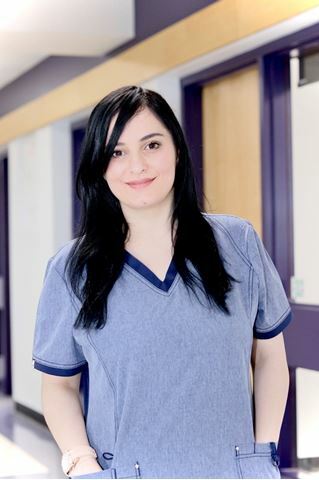 MITT Medical Office Assistant student Anita Dokaeva’s heart is in the healthcare field—an affinity she developed over years of accompanying her mother to medical appointments after their arrival in Canada in 2005 as refugees. Originally from Grozny, the capital of Chechnya, a former part of the Soviet Union, Anita and her mother fled their home to escape Russian bombardment of the city in early 1995. “Back in Chechnya she covered me during an attack and she suffered head trauma because of that,” said Dokaeva. After leaving Grozny, Dokaeva (then three), her mother, and 400 others forced to escape the violence, made their way to the neighbouring republic of Georgia where they settled in an area designated for refugees. The 1994-96 Russian-Chechen conflict would eventually result in the displacement of an estimated 500,000 people. “It was an abandoned hospital, where there was no one there so they pretty much made it a camp for refugee people,” recalls Dokaeva, who lived there with her mother for 10 years. (Anita’s parents divorced before the war began.) She and her fellow refugees survived off of the goodwill of locals, who often brought flour, beans, oil, and onions so they could prepare food. There were no education options for children. “There was no schooling, nothing. Basically you just played with your friends outside,” she said. Things changed one day in 2004 when representatives from the Canadian government arrived. Dokaeva’s mother made an appointment and sat down for an interview. The process culminated when, after six months, they were told they had been accepted as refugees and needed to prepare to leave. They had a week. “We were told, ‘Pack whatever you have and whatever you don’t have once you come to the country we will give it to you,’” said Dokaeva. After an overseas flight, she and her mother spent the night at a hotel in Toronto before getting back on a plane the next day for their ultimate destination—Winnipeg. It was early 2005. After arriving they stayed in a hotel near the Manitoba Interfaith Immigration Council’s Welcome Place, in the Central Park area of downtown Winnipeg, for two or three weeks. Eventually, Dokaeva and her mother settled in an apartment on Furby Street. Because of the injury her mother suffered, she was unable to provide for the family. Almost immediately Dokaeva found a job at McDonald’s and started attending classes at Gordon Bell High School at the same time. She was 15 years old. Her English, by her own admission, wasn’t so good at the time. But she found she was able to develop the communications skills necessary to adapt to her new environment. Dokaeva graduated from Gordon Bell in 2010 and at the same time moved on from her job at McDonald’s. She landed full-time work at International Clothiers, a men’s retail fashion store, where she worked until last August. She often thought about continuing her education, but the timing and right opportunity had yet to present themselves. “I was supporting my mom and I have a little brother, he’s my step brother, but his dad left my mom alone, so on top of looking after her I had to look after a little child as well,” said Dokaeva. With the healthcare field foremost in her mind, she discovered MITT through a friend and was urged to go to one of the Manitoba Jobs and Skills Development Centres, where prospective students could apply for funding to attend a post-secondary institution in the province. After meeting with an advisor and telling her of her background, Dokaeva received some good news: they would cover half of her tuition. The advisor recommended she look into MITT, which she did, and upon acceptance to the school she received the added bonus of having her full tuition eligible for coverage. Now past the halfway mark of her Medical Office Assistant program at MITT, 28-year-old Dokaeva is thoroughly enjoying her coursework and all of the new things she is learning. She says she looks forward to her practicum, eventually securing employment in the field, and all of the opportunities that will afford her in the future. It’s another exciting step in what Dokaeva acknowledges has already been a remarkable journey. And she’s quick to offer special praise to the people who have helped her along the way, like her instructors Luba Krywonizka and Dale Harrington.